In the spirit of giving this Christmas season, I’ll be having more giveaways this month, aside from My 1st Anniversary Big Blog Giveaway! Yaay! First up, I’ll be giving away these two gorgeous dresses personally handpicked by me! Aren’t they so pretty? <3 Read more for three simple steps to join! 1. Like One Day AND Pustura * Manila on Facebook. +5, post this as your Facebook status: “OMG! 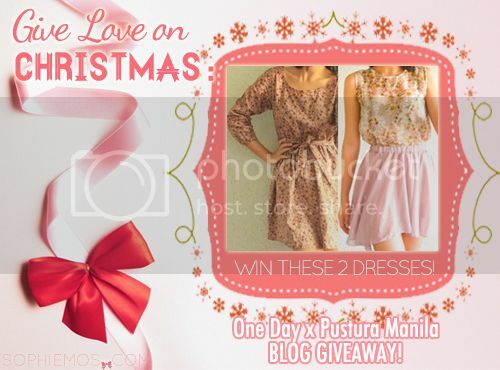 I want to win those pretty dresses from @Pustura Manila at www.sophiemos.com! Check @One Day to win amazing prizes!” Make sure you tag One Day AND Pustura Manila. Also make sure your account is set on public, so that I can verify it.